Today, success and sustainability are both possible. And our Easy on the Planet Learning Center is just one of the ways we're helping customers achieve these goals. Here you'll find everything you need to run your business eco-consciously  from products and recycling solutions for laptops and more to an eco-terms glossary and everyday eco-tips. Together, all of our changes can make a difference. Choose from a wide assortment of products with environmental benefits at Staples. From recycled desk accessories and third-party certified technology to eco-conscious cleaning supplies and compostable cups, we have green choices for every part of your office. Best of all, we've made it easy to shop green throughout the site. Outdated technology doesn't have to end up in a landfill. So when it's time to upgrade your hardware or replace your ink and toner, count on Staples to recycle it responsibly — and make it easy. 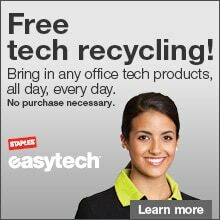 Learn more about recycling at Staples. Know how to make better choices for your office, home and the planet. Learn more about identifying green products. Green your printing and shipping choices. Show your commitment to the environment by using eco-conscious Copy & Print products and services in your day-today business. Learn more about greener Copy and Print services. We believe success and sustainability are both possible. Like every company, we want to be successful, and all of us want to do it sustainably  not just for ourselves, but for our customers and communities. We're working hard to achieve this through a continued focus on sourcing more sustainable products, improving our green services, maximizing energy efficiency and renewable energy use, and eliminating operational waste. Learn more about our eco-goals and initiatives. Making a difference is easy. There are so many ways to be green at the office and at home. Purchasing eco-conscious products is a great first step. Learn more about ways to green your office.